Leave at junction 29. Take the A617 towards Chesterfield, and then take the A619 towards Bakewell/Chatsworth. Continue for approximately 8 miles. At Baslow turn right at the 2nd roundabout (A623 Stockport/Manchester). At Calver turn right at the traffic lights to B6001 (Hathersage) to Grindleford. Turn left along the B6001 to Hathersage. After 2 miles turn left at a T-junction onto the A6187 (Castleton). When you reach Hope turn right at the Old Hall Public House on to the Edale Road. Follow the Edale road for 4.5 miles until you reach Mill Cottages. 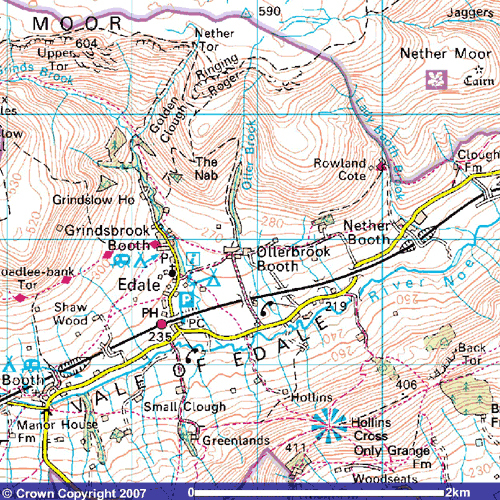 On your journey from Hope to Edale you will pass The Cheshire Cheese Pub on your left, and after a few miles you will reach a very small hamlet called Nether Booth. Just before Nether Booth Farm on the left there is a sign for ‘Edale’. Ignore this sign, it is confusing, the village is still 2 miles away. At Mill Cottages pass the row of Victorian terraced cottages on the left and the telephone box on the right. After 200 yards look out for a lane on the right – there is a derelict barn on the corner of the lane and the Edale road. At this point refer to the diagram below. The lane will be marked with a sign stating ‘Ollerbrook access only. No through road.’ Continue up the lane for 0.4 miles. Middle Ollerbrook House and Ollerbrook Cottages are the first dwellings on the right. The car park is on the right, in front of the property. Leave at junction 36. At the first roundabout take the right-hand exit for the A61 to Sheffield. Continue to follows signs for the A61 to Sheffield. Travel south on A61 towards Sheffield for 5.5 miles into the outskirts of Sheffield and then turn (at a Pizza Hut) right onto the A6101 (signposted Glossop (A57)). Follow this for about 4 miles along the Rivelin Valley and turn right onto the A57 at the end (take great care at this junction!). Follow the A57 for 6 miles until the Ladybower reservoir. Turn left at the lights onto the A6013 through Bamford; after about 2.5 miles turn right at the lights onto the A6187 road from Hathersage, and continue to Hope (from there see instructions above). Take the A6 to Chapel-en-le-Frith and then follow the signs for the A6, but take the slip road signposted Pushup and Edale (A6187, Sheffield Road). Turn left, and follow signpost to Barber Booth just after some speed bumps (steep ascent) and continue down the hill into Edale. Go through Edale towards Hope. After approx 2 miles, turn left down the lane mentioned above to the cottages. 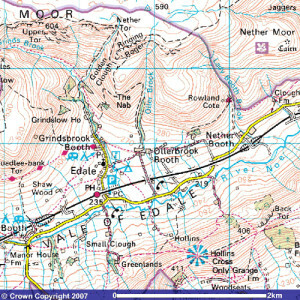 Please note that Orange mobile phones work once you have entered the Edale Valley, other networks are difficult to get.